Maechee Pratin Kwan-Orn was bom in Petchaburi , Thailand . Her family farmed and had a small business. So, Maechee Batin studied while helping with the family business and farm duties. Her talent and determination proved quite significant, and she earned her Bachelor's degree in India in 1974 at Nalan University . She continued her studies and took her Master's degree from Makot University , India in 1977. In terms of her religious career, Maechee Pratin Kwan-Orn went forth as an alms mendicant Maechee in 1963 at Wat Sanambrahm in Phetchaburi. She studied Pali and received Grade 6 in Pali in 1970 in Bangkok . By 1973, she graduated with excellence in Pali in India as a Pali Achariya from Nalanda University . After she completed both her worldly education and monastic education, she put to practice her wisdom and compassion and in 1977 along with Maechee Dr. Sumon Yuyot, and they founded the Thai Maechee Institute at Paktoe, Ratchaburi. The Institute developed the role of Maechees, and has helped countless women, children and men by applying Dhamma in daily life. In 1978 Venerable Maechee Pratin started a girls' nursery school within the compound of the Thai Maechee Institute of Prachinburi, a branch of their main office. Maechee Pratin's earnest efforts have been acknowledged, supported and recognized by many, including the Buddhist Women's Association of Thailand, which presented her with a Medallion Award for Excellence in Social Service, and the Ministry of Education which honored her and Princess Sirindhom personally presented her with a Sema Dhamma Chakra Award. 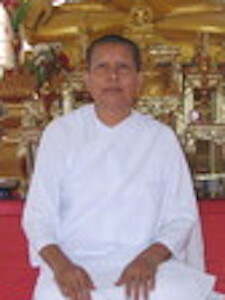 Maechee Pratin currently is President of the Thai Maechee Institute and Founder of the Dhamma Charini Witaya School for Maechee and women in need. Maechee Pratin is strongly determined to improve the educational opportunities for maechees, women and girls. She is committed to their having an equal opportunity to receive an education in order to cultivate good citizens for society.